In an earlier post (Falling Like Penguins) I talked about the two classes I was enrolled in, one with Ski Patrol and one with the Mountaineers. Unfortunately I had a few setbacks this winter and was unable to complete the MTR class with Ski Patrol. However, I have now nearly completed my Scrambling class with the Mountaineers. Scrambling comes with several definitions. 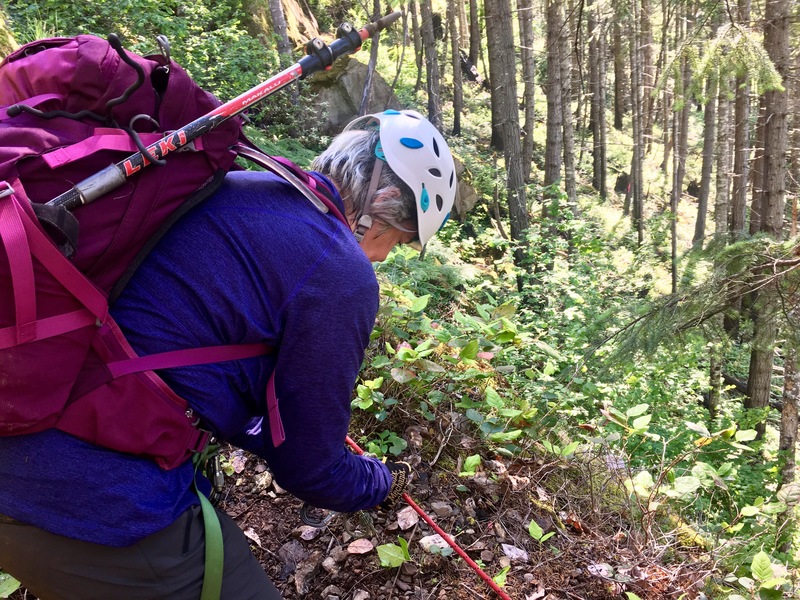 From moving over steep terrain using your hands and/or knees to an activity halfway between hiking and technical climbing, books and the internet abound with explanations. Adding to the above definitions, it takes place on both snow and rock, is a form of climbing on less technician features without the aid of ropes, and often contains varying degrees of exposure. 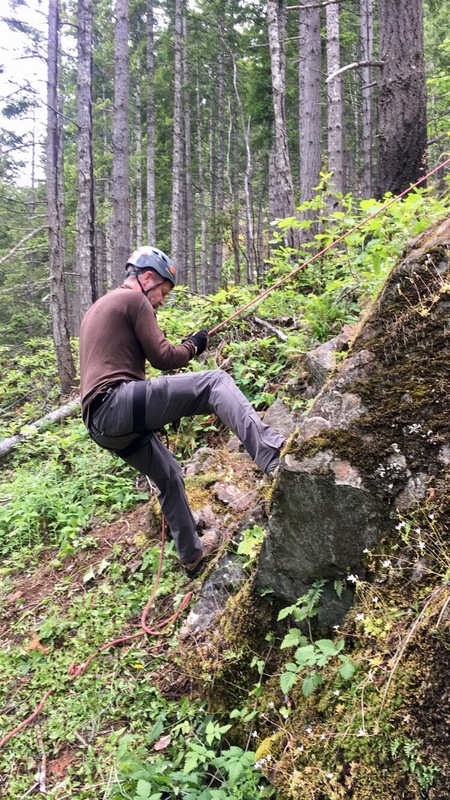 On June 3rd, we completed the winter/snow portion of the course with a scramble up to Manatee Mountain (also known as Foss Peak) in the Tatoosh area of Mt. Rainier National Park (MRNP). Led per usual by amazing Mountaineers volunteer leaders, this climb was a challenge and a learning experience even as we pushed on up steep inclines, navigated a ridge avoiding harrowing cornices, and took part in what were some of the steepest, longest glissades several of us had ever done. With the snow portion concluded, it was time for the focus of the class to switch to rocks. Rock Scrambling is climbing without technical rope systems and equipment. 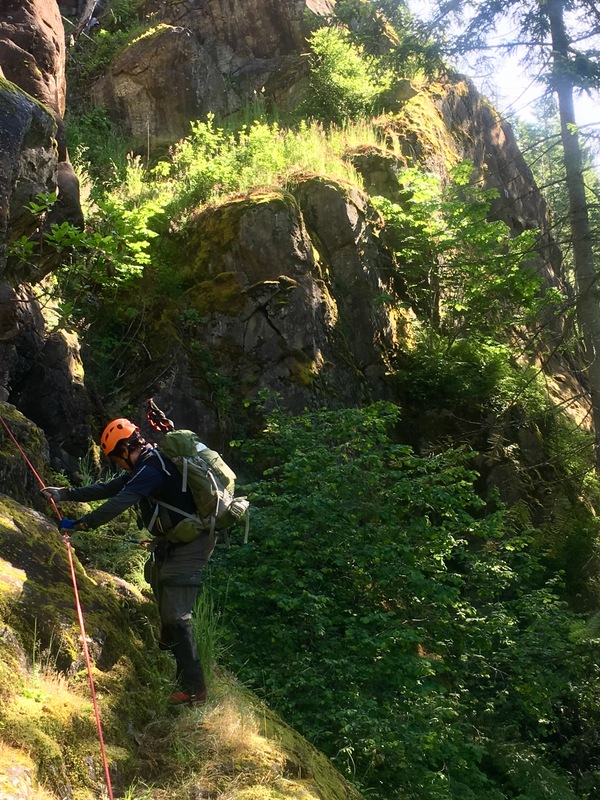 This does not negate the exposure or risk that can be involved on some of the more difficult routes, but it does draw a line between what kinds of routes one intends to pursue with and without ropes. 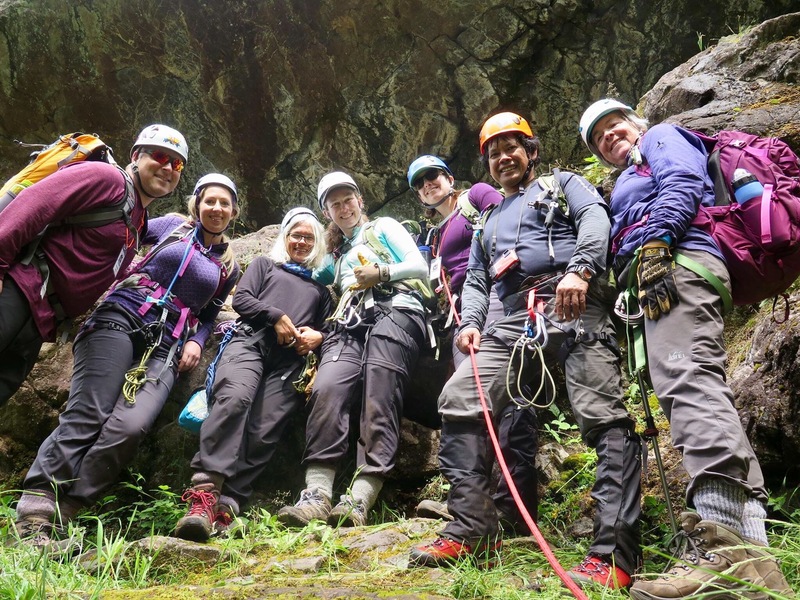 The Mountaineers also include some elements of basic rope-work in the class due to the fact that conditions can change, climbers can get injured, and sometimes a basic rope system can help get people out of trouble when something goes wrong. 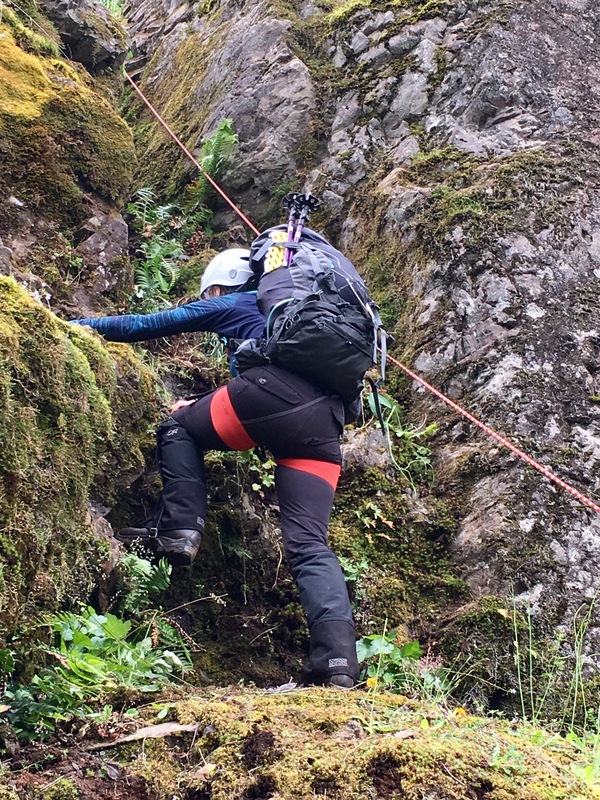 The rope use we learned involves prusik knots, which is essentially attaching yourself to a larger rope using a small rope that serves as an emergency brake if you fall. 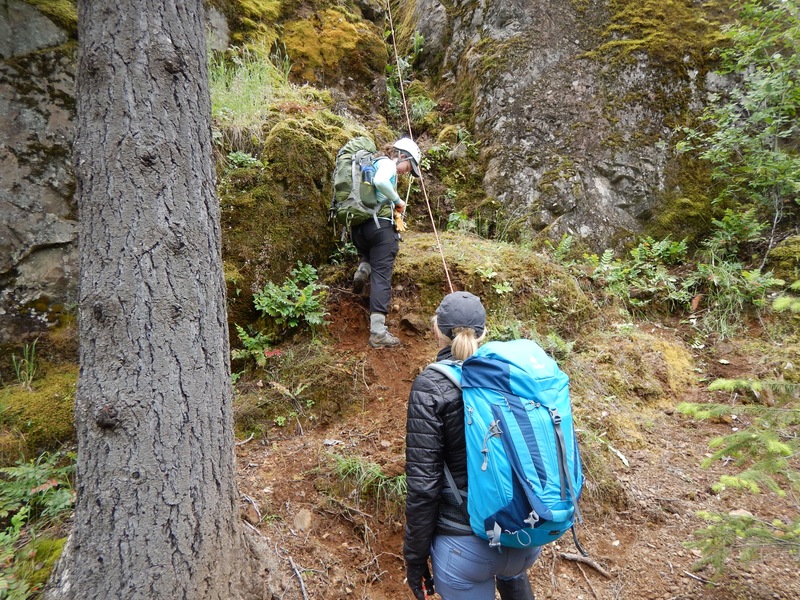 We practiced traversing with prusiks as well as ascending and descending. Note that in these photos, the rope being used is there to act as a backup if things go wrong. Our hands contact the rope to slide the prusik along so it moves with us, not to use the rope to assist in our climbing. The other skillset with ropes involves being able to rappel down using just our bodies, the rope, and the friction caused between the two. 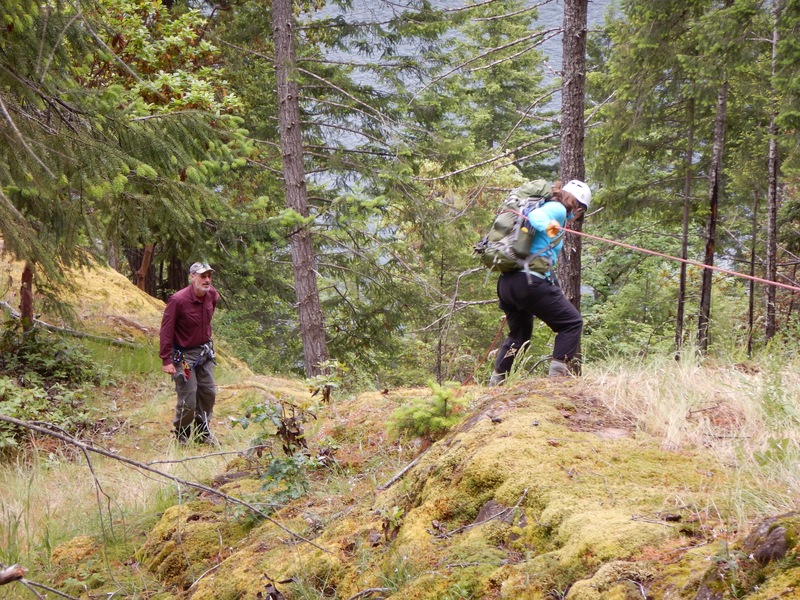 The methods, arm rappel and dulfersitz, can definitely cause some rope burn if you move too fast, but as we found out firsthand they are very effective for getting down something steep, especially if the conditions have changed or someone in the party is afraid to climb down. 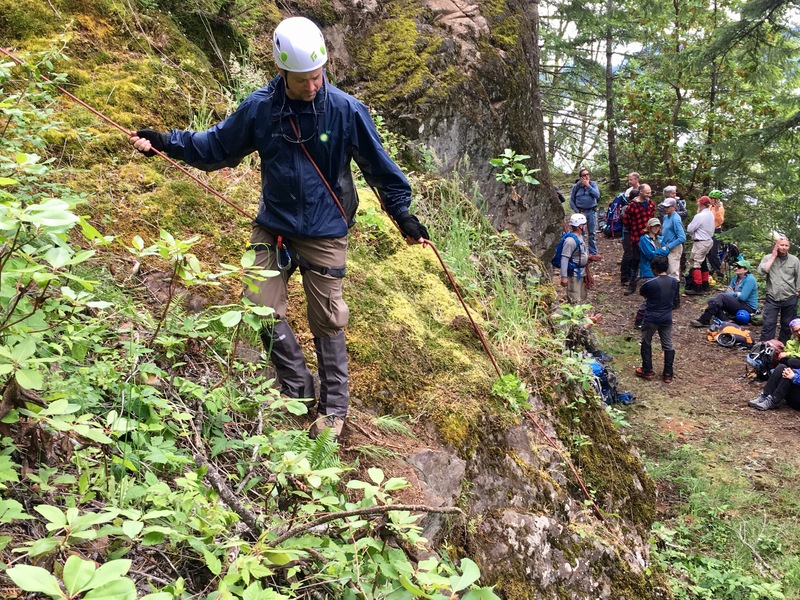 We first learned the above in the classroom, then on Sunday took it out to some cliffs around Lake Cushman, known to the Mountaineers as McCleary cliffs. 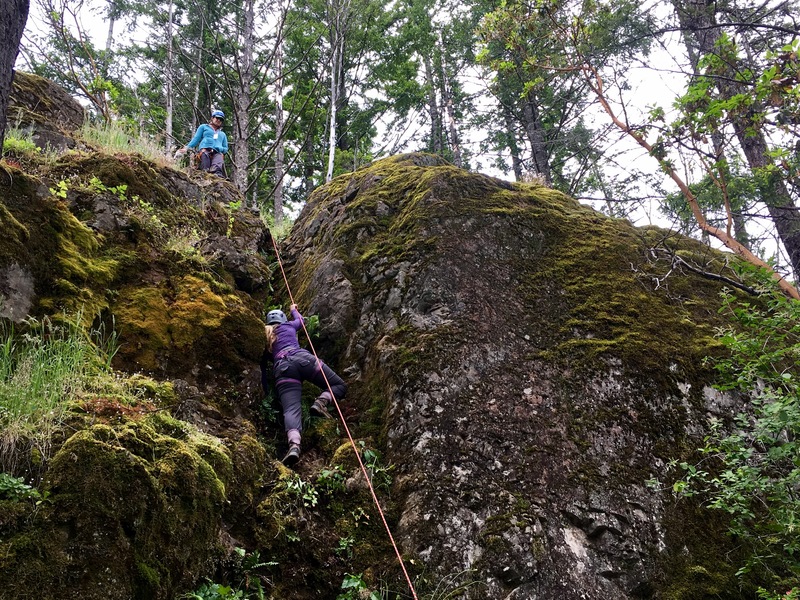 In addition, we practiced boldering and going off trail in more difficult terrain, all in preparation for future scrambles (at least one full trip is required before we can graduate from the course). Climbing has always been outside of my comfort zone, so this has been a challenge and area for amazing mental growth for me. It’s even starting to seem possible to consider the full climbing course next year, something I previously swore I could never do. Pretty amazing when we push ourselves and discover all that we are capable of. ← Who Builds the Trails?